These buildings include one or two private dwellings, apartment houses (flats), hotels, dormitories etc. These buildings include any building used for school, college or day care purposes involving assembly for instruction, education or recreation. These buildings include any building or part which is used for medical treatment etc. Such as Hospitals, nursing homes, orphanages, sanatoria, jails, prisons, mental hospitals etc. These buildings may include any building or part of a building where a group of people gathers for recreation, amusement, social, religious or such types of purposes such as theaters, assembly halls, exhibition halls, restaurants, museum, club rooms, auditoria etc. These shall include any building or part of a building which is used for business transactions, keeping records of accounts, town halls, city halls, court houses etc. These shall include those buildings which are used for soap, market, stores, wholesale or retail. This types of building mainly used for manufacturing purposes. Here products or materials of all kinds and properties are fabricated, assembled or processed, for example, gas plants, refineries, mills, dairies etc. These buildings are generally used for the storage or sheltering of goods, wares, or merchandise like warehouses, cold storages, garages, stables, transit sheds etc. These buildings include any building which is used for storage, handling, manufacture or processing of highly combustible explosive materials or products which are liable to burn with extreme rapidly which may produce poisonous fumes, building which is used for storage, handling or manufacturing highly corrosive, toxic, acid or other liquids or chemicals producing flame, fumes explosive etc. Also Read – How To Select Site For Building Construction. If You Liked This Article Then Do Not Forget To Share With Your Friends. 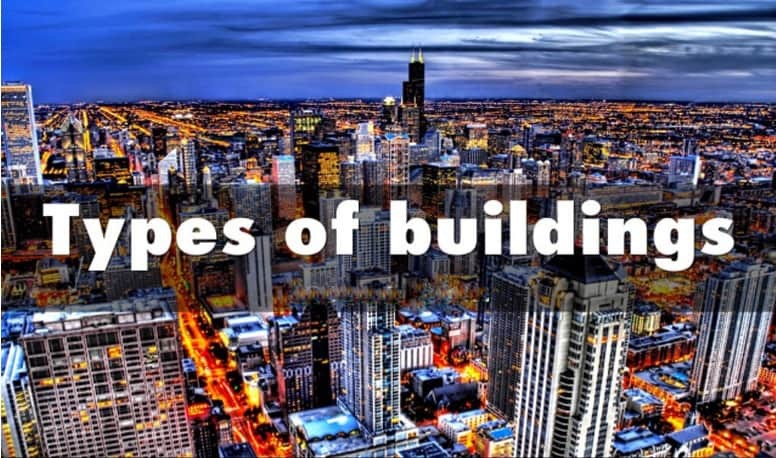 Tags: Types of Buildings, Building types, Classification of Buildings.